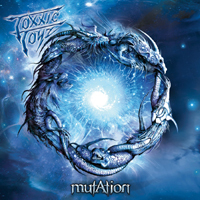 For a first album, Mutation isn't half bad, not the best album of all time but it's solid. The production gets a mite wonky at times sure. But overall this is an album worth acquiring, and a band worth keeping an eye on. Their sound is raw, reminiscent of classic metal of the early nineties. The band claims to be traditionalists sound wise, not using keyboards to sully the purity of their metal. And this does carry over in their sound, primitive, gritty and twangy with that awesome hollow cassette tape sound. They know their craft these kids no doubt about that. The vocal stylings of David Mcbee have a raw gravely quality to them that bear comparison to early Meliah Rage. The album covers themes like evolution, the garden of Eden and even the new world order, but more importantly they seem to be concerned with revolt and overthrowing the system, so maybe get this record if you like good metal. BUT definitely get this album if you own a Guy Fawkes mask, know what the bilderberg group is or believe that the new world order is under your bed right now. Destroy the old paradigm - support anti consumerism. Buy this album, and some merchandise.